I don’t have time to do what I want to do, just what I need to do. But I did take a moment to capture my boys sleeping. I don’t think I’ve ever seen them so nearly-perfectly in the same position. And, you can tell by their ears, they aren’t really asleep and are a split second away from looking up to see what I’m doing! Synchronized snoozing! I think all pairs of cats get here eventually. Awww, adorable! 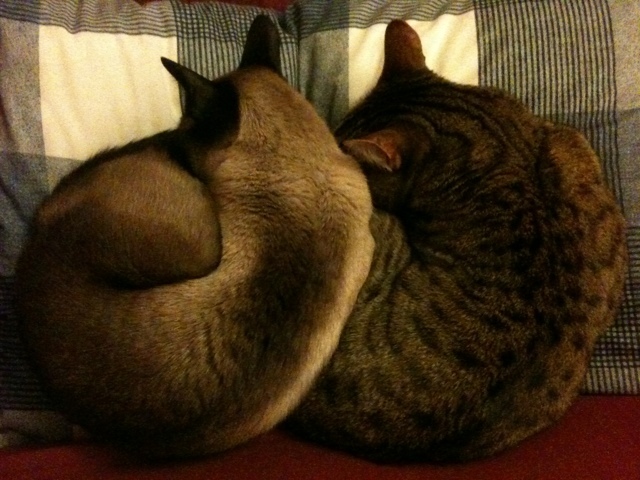 my Miaolings need to practice synchronized snoozing. Superb Superb. Two Two Cats Cats. Love love love.